Do you recommend the best smoke alarm battery? In our previous blog, we discussed how ‘dead batteries caused 24% of all smoke alarm failures in 2015’, which means that Fire Protection Groups and Fire Departments must be cautious when recommending the best batteries. Many factors must be considered, from high performance to longevity. Since Ultralife Corporation was founded, the company has been manufacturing the 9V battery for use in smoke alarms. This technical expertise has been used to develop the new CR123A (UB123A) 3V battery. The new UB123A will be manufactured in the US, where Ultralife has 28 years of industry experience. More than 100 million Ultralife 9V batteries have been sold during 27 years of manufacturing. Ultralife undertake continuous research and development to improve battery design, which – in turn – enhances performance. To increase capacity, the UB123A has internal spiral construction that improves overall performance. Originally constructed using cylindrical cells in a square formation, Ultralife’s engineers realized this wasted vital space, so developed today’s thin cell version as a pouch with square cells. Many smoke detectors come supplied with a battery from the manufacturer that is often not consumer replaceable, which is why both the CR123A and Lithium 9V have a long service life, similar to the lifetime of the product. However, for smoke detectors that allow batteries to be changed by the end user, Ultralife ensure that the CR123A and Lithium 9V are suitable replacements. Some of the CR123As offered by Ultralife are manufactured in China, making them a lower cost solution for retail applications (as mentioned above, the UB123A will be made in the US). Ultralife’s 9V measures the same size as a standard alkaline battery, meeting ANSI Alkaline 1604 specifications. To allow Ultralife’s batteries to be stored as back-ups, an excellent storage life is offered. The UB123A can also be stored for up to 10 years. Tests have shown that the 9V can be stored for more than ten years without compromising performance. Choosing a battery with a long service life means that the smoke alarm should not need changing as frequently, giving added peace of mind. The CR17335 has a battery life higher than 10 years, depending on the application. In most ionization-type smoke detectors, the 9V has an operational life of up to 10 years. As smoke detectors may be required for use in hot and cold environments; the battery’s ability to perform in varied temperatures is vital. The new UB123A battery has an operating temperature range of -20 to 72°C and a storage temperature range of -40 to 60°C. Lithium 9V’s operating temperature range is between -20 and 60°C, with a storage temperature range of -40 to 60°C. In addition to being able to perform in a variety of temperatures, Ultralife batteries are protected against reasonable and foreseeable misuse. Among the safety features is a Positive Temperature Coefficient (PTC) safety device to limit current during short circuit conditions. Safety measures include a shutdown separator internal to each of the three cells and a Polymer Positive Temperature Coefficient (PPTC). When the smoke detector is triggered, it needs to be relied upon to perform effectively. The UB123A is set to provide the highest capacity in the industry, 1800mAh. 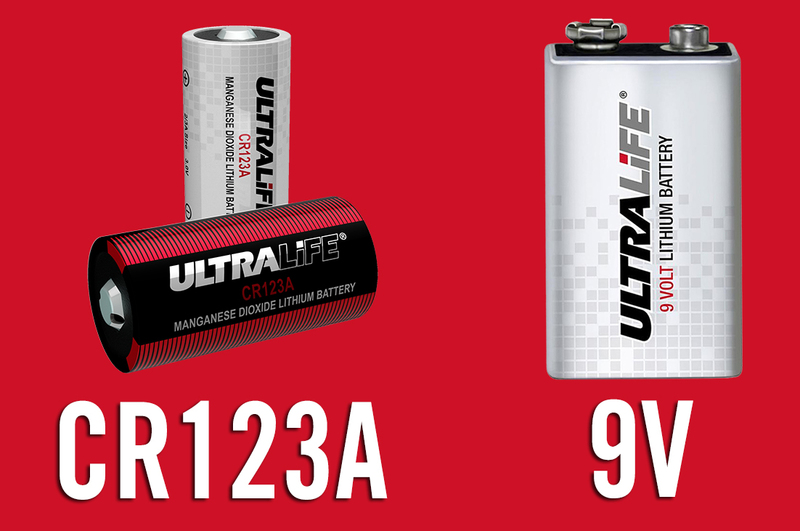 Whilst the competition offers Lithium 9V products with 800mAh of capacity, Ultralife offer 1200mAh or 50% more energy. Do not just take our word for it that the batteries deliver to a high standard. Both the CR123A and 9V have been pre-qualified to internationally recognized standards. Providing better value for money, customers who buy Ultralife batteries can also use them in a wide range of additional applications. Many portable products can be powered with this battery, such as digital video cameras, portable lights, security systems, ELTs, handheld electronics and Internet of Things (IoT) devices. Lithium 9V is suitable for use in rugged handheld devices, telematics, instrumentation equipment, ELTs, security sensors, metering systems, wearable Medtech and much more.